As the final late-spring frost rolls off the Fort Valley Plateau, the air smells a little sweeter and Georgians’ smiles get a little bigger because this is a clear indicator of the arrival of peach season. This energy runs through the 1,400 acres of trees on Pearson Farm, located in the heart of Peach County, GA. From May through August, the arms of these trees are weighed down with plump peaches waiting to be picked by farmhands or young hooligans using the farm as their summer playground. In this exact spot is where Stephen Rose sunk his teeth into a sweet Georgia peach and gleefully let its sweet, sticky contents dribble down his 7-year-old chin. Some years later, as Stephen laid his head in Nashville, he began to dream of those Georgia peaches. Stephen tells tales of growing up visiting Pearson Farm — located only five miles from his childhood home and owned by friends of the family — and shares sweet memories of summertime and peach ice cream. “I wanted to bring a piece of my hometown to Nashville,” Stephen says from his home in East Nashville, where he raises his 18-month-old daughter and works the magic behind The Peach Truck, a 4-year-old company he founded with his wife, Jessica. Beginning in 2012, Stephen and Jessica loaded up their 1964 Jeep Gladiator, now fondly known as The Peach Truck, with Pearson Farm peaches and brought the best peaches in the country — according to Stephen, Jessica and everyone who tries them — to Nashville. And, with that, his dream of bringing Fort Valley to Nashville was a reality and their business was born. Each of The Peach Truck’s peaches are hand picked from Pearson Farm in Georgia. Pearson Farm is located on the Fort Valley Plateau, which is blessed with mineral-rich, red clay soil; relatively consistent temperatures and high levels of humidity. The farm also thins their trees more than most — allowing the best peaches to soak in all the nutrients the tree can offer. “We want to represent summer in Nashville,” Stephen says. With 55 locations running from Hendersonville to Nolensville, Franklin and back to downtown Nashville, it is becoming hard to imagine summer without The Peach Truck! Jessica and Stephen each bring something different to the table, making them an unstoppable force in the world of peaches. At each of The Peach Truck’s locations, peaches are available for purchase by the bag (around 3 pounds) or by the box (25-pound, 1/2-bushel box). A city synonymous with cowboy boots and hot chicken has readily made room for handmade jeans and fresh peaches, come summertime. “I can’t imagine a better community to start a business in,” Jessica says. “We have had a rally of support.” Jessica and Stephen sold their first peaches outside of imogene + willie, which is only one of the thousands of tiny decisions that have informed the business. “It was a natural move.” Stephen shares of the choice to partner with this growing Nashville company owned by good friends. In 2012, farmers markets were growing in popularity, but just as they did in the beginning, The Peach Truck continues to sell outside the normal boundaries of fresh produce retail. And while you can find them at the Nashville Farmers’ Market, 12 South Farmers Market and all markets in between, they also set up shop at restaurants (including The Juice Bar, Hattie B’s and Martin’s Bar-B-Que) and local shops (including Flower Mart, Cindi Earl Fine Jewelry and, of course, imogene + willie), which truly integrates them into the community. This decision to partner with local businesses and the early decision to knock on City House’s front door with peaches in hand, helped propel them into peach stardom. The Peach Truck entered the game at a time that Nashville’s food scene was beginning to boom and The Peach Truck was — and still is — able to act as a resource for all things peaches in Nashville’s culinary community. City House might have been the first, but nowadays you can find The Peach Truck’s peaches listed on menus at Husk, Pinewood Social, The Catbird Seat, The Wild Cow, Graze, Five Daughters Bakery, Marché, Margot, Burger Up, Lockeland Table and Dozen Bakery, just to name a few. But the coveted brown paper bags are the thing to look for. Each bag, packed with peaches, is an invitation to enjoy the South’s most desired summer crop: a hand-picked Georgia peach, from the palm of your hand. Find The Peach Truck at local markets and outside local businesses. 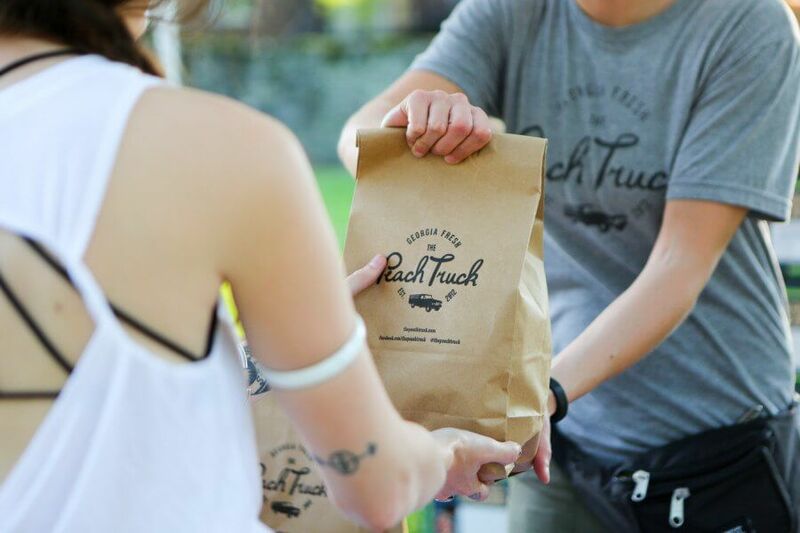 Thoughtful decision making and a knack for social media have helped bring them to the forefront of Nashville’s summer, but downright delicious peaches and consistent quality are the backbone of The Peach Truck’s brand. “We learned the sloppy, messy, fruit-fly way,” Jessica says of the learning process of starting a business. But today, she is looking toward the future. “We want to have the best team, which we do; we want to have the best product, which we do. Now, we have to ask ourselves, ‘How do we go that extra mile for the customer? '” To that end, The Peach Truck continues to expand upon opportunities through which to service you, the client. Their website is home to mouthwatering peach recipes; they are taking peaches on the road to hit 126 stops in Tennessee, Kentucky, Ohio, Indiana and Pennsylvania with their Freestone Tour; they ship boxes filled with 13 hand-picked fresh Georgia peaches to out-of-towners across the country; they are educating people not only about peaches and their many varieties, but also the produce world at large; and, they will spend the off season consulting with small businesses and sharing their experiences in building a successful company. All of these efforts benefit peach lovers of all varieties, from the hipsters in East Nashville to the moms in Franklin, and they only hope to expand their presence in Nashville. “We want our customers to stay customers for a decade,” Stephen says. Grab the peaches while you can. We promise you will be nothing but delighted. Before the last peach is plucked from the trees and the truck packs up for the summer, get your fill of farm-fresh Georgia peaches. Put those fresh Georgia peaches to good use with the Peach and Berry Cobbler recipe! Thank you to Stephen and Jessica for inviting us into their home and sharing a piece of The Peach Truck with all of us! And thank you to Leila Grossman of Grannis Photography for today’s beautiful photos.